This pathology, of micro-traumatic origin, is due to an inflammation of the patellar tendon at the tibial tuberosity. It is probably linked to traction of the patellar tendon on the periosteum, which causes a diffuse necrosis on the apophyseal joint. It usually affects athletes between the ages of 10 and 15, especially when they are going through growth spurts. Sports that require a lot of leaps and jumps (such as gymnastics, athletics, football, basketball and dance) are more likely to incur this condition. It affects boys more often than girls, and in 25% of cases there is a bilateral localization. Pain is specific and is generally presents on the anterior tibial tuberosity during sporting activity. It may also occur when traversing stairs or squatting. In severe cases, it also manifests when at rest, and worsens when the quadriceps femoris muscle is contracted. On palpation, tumefaction and localized pain may also occur. 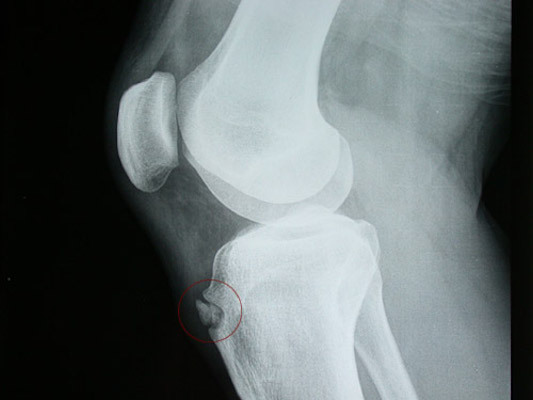 Radiographically, a fragmentation of the apophyseal joint is visible (Fig. 1). Left untreated, the condition could lead to an apophyseal fracture, which requires quite some time to heal. During the acute phase of the condition, the athlete must stop sporting activity and follow an anti-inflammatory course at both at a general level and local level. Physical therapy uses Magnetotherapy and Tecar therapy on the involved area. Local cortisone treatments are not generally recommended and may be detrimental to the depolymerization of the cartilage and possibly cause skin atrophy. Surgery is only used in the most extreme circumstances. Side-effects of the condition include hypertrophy of the anterior tibial tuberosity, which can cause discomfort in some sporting activities such as judo. Intrathendinous ossification may also occur in adulthood if a patient has suffered from Osgood-Schlatter disease. Resumption of sporting activity should take place only one to three months after the onset of pain. Certain exercises, consisting of jumps or leaps, must be avoid during the recovery phase. During workouts, a patina or a patellar discharge brace can be useful.